The front view of the Xie He Gate. It leads to the imperial library, Wen Yuan Ge. 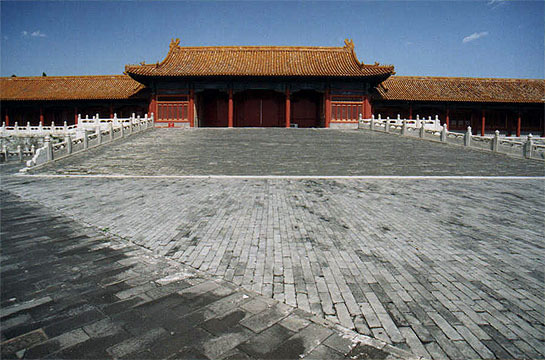 The library is the only building with a roof of black tiles in the Forbidden City. According to the ancient Chinese, water is represented by the color black. Water can extinguish fire, a constant threat for the huge collection of books inside. The royal library houses the encyclopedia Si Ku Quan Shu, a 79,337 volume historical record and feudal rites compiled between the year 1772 and 1781.